day, then if they do not green enough, put in a small quantity of of (blew?) Vittroll; when you have so done, and they are green enough, then put them into a stone pot, and tie them down: you must put them up with the best White-wine vinegar: and then in two or three days they will be fit for use. A receipt for kitchup take 3 pints of fresh beef brine, and strain it before you boil it, take a quarter of an ounce of whole pepper, a quarter of an ounce of cloves and mace together, and one nutmeg sliced, take eight large anchovies and wipe them, put them all together into this liquor over a moderate fire, till those remain but a quart, then put a quarter of an ounce of mushroom powder, then boil a quarter of an hour, and take care that it do not boil over, then put in half a pint of Claret, then boil it about a quarter of an hour, then let it stand till it is cold, and put them all together into a glass bottle, and then it is fit for all sorts of sauce, for flesh, for fish, or fowl. 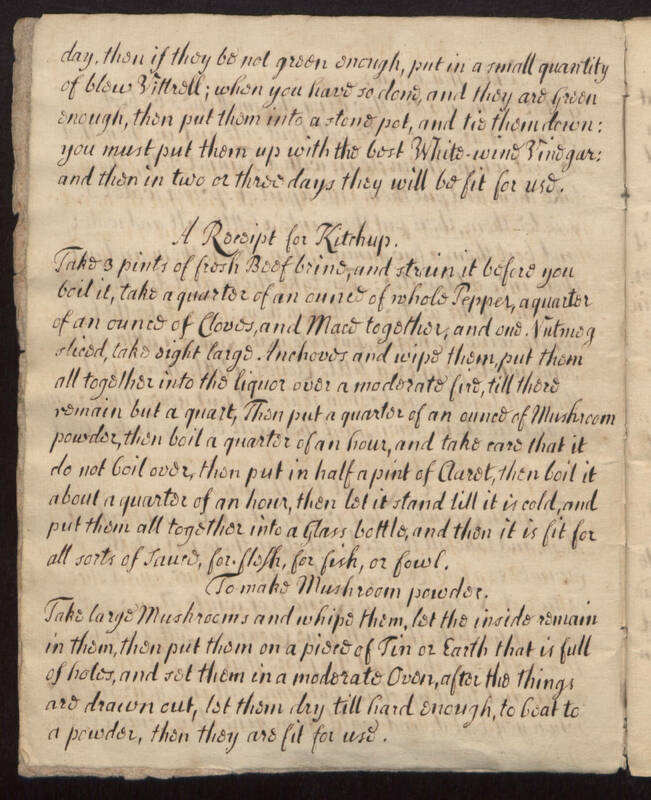 To make Mushroom powder Take large mushrooms and whip them, let the inside remain in them, then put them on a piece of tin or earth that is full of holes and set them in a moderate oven, after his things are drawn out, let them dry till hard enough, to beat to powder, then they are fit for use.